« Prestigious Vancouver BINNING TOWER Condos, Townhomes & Penthouses in the UBC Point Grey Vancouver Westside Real Estate District > 22 Stories of Luxury Binning Tower Vancouver Homes for Sale from Low $500’s! Focal Point Surrey is a new condo and retail opportunity located at 64th Avenue and Fraser Highway along the Langley/Surrey border. Featuring 57 exclusive condos and 14 prime retail spaces for sale, the new Surrey Focal Point real estate project is now underway and selling! Distinctive curved architecture and an all glass frontage façade makes the new Focal Point Surrey condo building truly unique and striking for this neighbourhood. The forward thinking floor plans and finishes are of great quality and the vision of combining liveable spaces, a walkable neighbourhood, design savvy features and useful amenities is all here at Focal Point Surrey condos. Each of the homes here have an outdoor balcony or roof deck, expanding not only your indoor living space outwards but also offering amazing views of Mount Baker to Langley. With close proximity to big box retailers and boutique stores alike in addition to restaurants to cafes, the new Surrey Focal Point Condos are at 64th Avenue and Fraser Highway Surrey BC. From Clayton Crossing to Willowbrook Mall, there’s Home Depot, Costco, Walmart and much more within close driving distance from your front door. It’s really all about convenience for families too. Top ranked secondary and elementary schools are nearby as well as Trinity Western University. Willowbrook Lanes and Fraser Downs Racetrack in addition to the Surrey Sport and Leisure Complex and numerous top rated golf courses are all within a fifteen to thirty minute radius surrounding you. The focus is on you. This is Surrey Focal Point Condos and Retail opportunities that are now selling. Focal Point by Suraj Group of Companies is now underway. Suraj Developers has over three decades of building experience in the Lower Mainland. 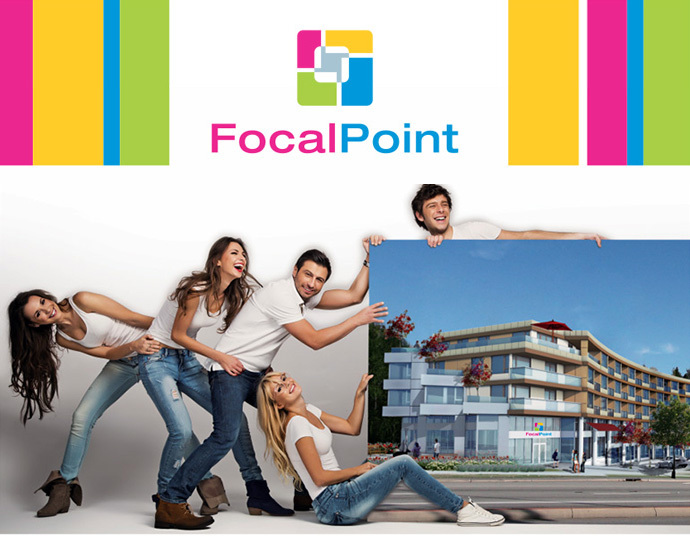 For more information about Focal Point Surrey condos and retail spaces for sale, please visit www.focalpointliving.com today. Some of the great features and finishes at Focal Point Surrey real estate development includes: generous layouts with 1 and 2 bedroom floor plans available right now in addition to two colour schemes to choose from. All homes have outdoor living space in addition to laminate floors through the living areas and carpets in the bedroom. There is front loading washer and dryer in every home in a laundry room in addition to elegant bathrooms with beautiful vanity units set above granite counters, undermount sinks and hand set tiled floors. The toilets are also environmentally friendly. The presales Surrey Focal Point condos will also feature high-end kitchens with a sleek stainless steel appliance set, soft close cabinetry and double bowl under mounted sink with quality fixtures. The kitchen counters are granite and the floors are non-slip tile. All homes are backed by the 2-5-10 National Home Warranty protection provided through Suraj Group of Companies developer. In addition, the oversized windows in the living space will provide lots of natural light as well as impressive views. There is also a specially commissioned art sculpture on site in addition to large social areas including a conference room, media room and 2,600 square foot outdoor entertainment terrace. The boutique low-rise at Focal Point condos in Surrey real estate market present spacious floor plans on 4 levels of residential space (there’s ground floor retail). On the 2nd floor, the Focal Point Surrey floor plans range in size between 532 square feet (1 bedroom and 1 bathroom layout) to 953 square feet (2 bed and 2 bath with 2 covered balconies). Most of the 3rd level homes are 1 bedrooms that range in size between 532 to 719 square feet (many of which are around 673 square feet). There are also larger floorplans at 1,106 sq ft (2 bed/2 bath) and other 2 bedroom layouts between 714 to 953 square footage. The fourth floor is very similar to the third floor floorplate. The presales Surrey Focal Point penthouse level will feature impressive homes and layouts. This is also the floor with the amenity roof deck and amenity room which is 673 sqft in size. The corner unit floor plans on the Focal Point penthouse level all have wrap-around balconies and range in size between 852 to 945 square feet (all corner homes are 2 bedroom and 2 bathroom). There are also a wide variety of other 1 to 2 bedroom layouts on this top floor. What is Focal Point? It is the convergence of striking architecture, befitting amenities and homes built for real living. Positioned at the meeting point of 64th Ave and Fraser Hwy, Focal Point forms a new focus for the Surrey-Langley border, bringing with it an entourage of retail and commercial facilities. Poised to bring only 57 executive condominium homes to Fraser Highway and 64th Avenue Surrey Focal Point condos is about convenience and living in a transit oriented community. There will also be 14 prime retail spaces at this iconic intersection. The presentation centre will be opening at 64th Ave & Fraser Highway Surrey.